Congratulations to our client, Mohannad Alzoubi, who is officially one of America’s newest citizens. Mr. Alzoubi’s immigration journey proved long for his family, but the outcome made the stress and the waiting worth it. Mohannad was born and raised in Jordan. It was there he came to know his future wife, Ethab, a woman he admired, and a woman with whom he wished to spend his lifetime. Mohannad and Ethab’s families were very close throughout their lives, as the two had known each other since childhood; they grew up together. While he focused on his studies in his early twenties at Jordan University of Science and Technology, Ethab broke the news that she and her family would be leaving Jordan to return to Michigan, where she was born. This left him heartbroken. He couldn’t guarantee a reunion with Ethab, but always thought that what was meant to be, would be. Mohannad graduated a year after Ethab’s departure from university in Ar Ramtha, Irbid, Jordan, with a Bachelor’s degree in Electrical Engineering, and he subsequently relocated to Dubai in 2001 to pursue job opportunities. He remained in Dubai for several years working as an electrical engineer. Meanwhile in the United States, Ethab maintained a friendship with Mohannad’s sister, Lobna, which allowed Mohannad to stay connected to Ethab. In 2006, after years of separation, Mohannad decided to take a leap of faith after Ethab graduated from Michigan State University with a Bachelor’s of Science degree in Chemical Engineering. Mohannad reached out to Ethab and asked if she was interested in pursuing a relationship with him, despite the years they spent apart. She was. Ethab returned to Jordan in 2007 and the two wed that same year, surrounded by friends and family. Ethab spent the next two years traveling back and forth between Jordan and Michigan to spend time with her family in the U.S. and her new husband. In the upcoming years, the distance between the couple would prove difficult to handle. The couple wanted to reside in the U.S. where Ethab had completed her education. And although Mr. Alzoubi had begun his green card application in 2007, he was still residing in Jordan when the couple’s eldest child, Adam, was born in Michigan in 2009. His newborn son was born with severe kidney problems. Not only had Mr. Alzoubi missed the birth of his child, but he was unable to be with his family through important surgeries and doctor appointments required by his son’s condition. Considering the stress that was already taking its toll on his family, Mr. Alzoubi grew concerned that he would not be granted his green card, and that he would wind up isolated from his family for many years. Mohannad Alzoubi with Attorney Albert Valk, September 2016. Fortunately, this was not to be. 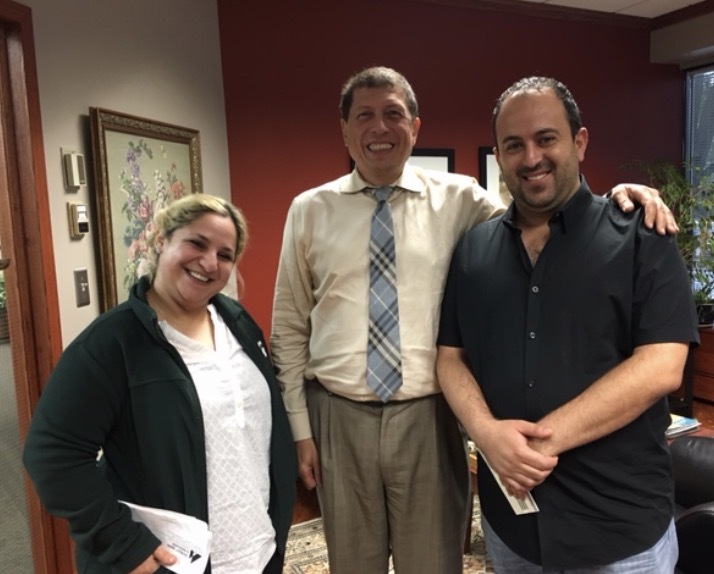 In 2010, Mr. Alzoubi received his green card and he could finally reunite with his wife and son in Michigan. After visiting his family in Michigan, he still needed to return to Dubai to see to his remaining work affairs. Upon returning to the U.S., Mr. Alzoubi came to our office in late March of this year to ask for help in applying for his Citizenship. With the help of Attorney Albert Valk, Mr. Alzoubi submitted affidavits, documents concerning living arrangement, medical information regarding his child, and job resignation letter to explain his work-related absences from the U.S. to Dubai and fulfill the requirements of his Naturalization application. Mohannad’s case was approved only a couple weeks later. The day he had been waiting for finally came in late September of this year – he is finally an American citizen. Mr. Alzoubi is grateful for his citizenship, and the fact that he is with his family full time. About his winding road to U.S. citizenship, Mr. Alzoubi writes, “I am able to take my child and drop him off at school, look after him when he is sick, buy my wife flowers, and do everything that a happy family would do.” He is now considering starting an immigration case for his parents. Congratulations, Mr. Alzoubi!